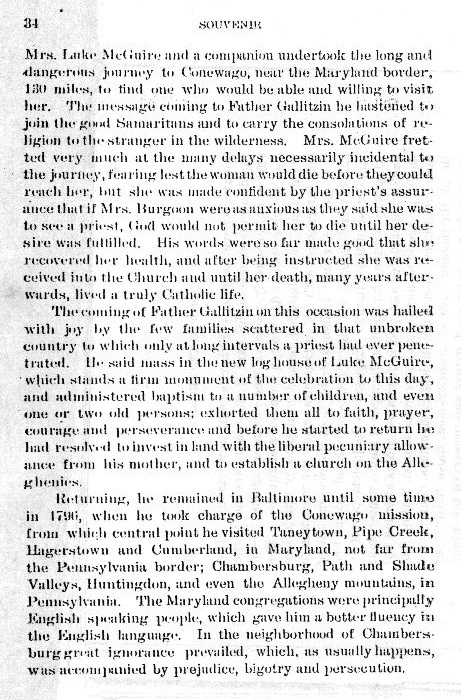 Mrs. Luke McGuire and a companion undertook the long and dangerous journey to Conewago, near the Maryland border, 130 miles, to find one who would be able and willing to visit her. The message coming to Father Gallitzin he hastened to join the good Samaritans and to carry the consolations of religion to the stranger in the wilderness. Mrs. McGuire fretted very much at the many delays necessarily incidental to the journey, fearing lest the woman would die before they could reach her, but she was made confident by the priest's assurance that if Mrs. Burgoon were as anxious as they said she was to see a priest, God would not permit her to die until her desire was fulfilled. His words were so far made good that she recovered her health, and after being instructed she was received into the Church and until her death, many years afterwards, lived a truly Catholic life. The coming of Father Gallitzin on this occasion was hailed with joy by the few families scattered in that unbroken country to which only at long intervals a priest had ever penetrated. He said mass in the new log house of Luke McGuire, which stands a firm monument of the celebration to this day, and administered baptism to a number of children, and even one or two old persons; exhorted them all to faith, prayer, courage and perseverance and before he started to return he had resolved to invest in land with the liberal pecuniary allowance from his mother, and to establish a church on the Alleghenies. Returning, he remained in Baltimore until some time in 1796, when he took charge of the Conewago mission, from which central point he visited Taneytown, Pipe Creek, Hagerstown, and Cumberland, in Maryland, not far from the Pennsylvania border; Chambersburg, Path and Shade Valleys, Huntingdon, and even the Allegheny mountains, in Pennsylvania. The Maryland congregations were principally English speaking people, which gave him a better fluency in the English language. In the neighborhood of Chambersburg great ignorance prevailed, which, as usually happens, was accompanied by prejudice, bigotry and persecution.